1. Read the passage several times. 2. When reading a passage, try first to understand it as a whole, rather than pausing to write down specific ideas or phrases. Look up any words you don't understand. 4. Be SELECTIVE, choose and summarise only relevant material that is useful for the purpose of your task. 5 . Think what "your own words" would be if you were explaining to someone unfamiliar with the topic (your mother, a sibling, a friend) what the original source said. 6 . You can directly quote one or two sentences from an original source. You must ensure, however, to put the quoted text in "quotation marks" and ensure you CITE that source in-text AND include it in your reference list. ​8. Carefully record bibliographic details for your reference list. ​1. Look away from the source then write. Read the text you want to paraphrase several times until you feel that you understand it and can use your own words to restate it to someone else. Then, look away from the original and rewrite the text in your own words. Read the text several times and take very abbreviated notes. You may want to create a 'Mind Map' or 'Concept Map' from these notes. Set the notes/Mind Map aside for a day or two. Go back to your notes/Mind Map and write your paper from your notes/Mind Map only (not the original text). Ensure to use your own words! Students frequently overuse direct quotation in taking notes, and as a result they overuse quotations in the final writing task. Probably only about 10% of your final writing task should appear as directly quoted matter. Therefore, you should strive to limit the amount of exact transcribing of source materials while taking notes. Lester, J. D. (2006) Writing Research Papers. 2nd ed. Pearson Education, Sydney, 46-47. In research papers students often quote excessively, failing to keep quoted material down to a desirable level. Since the problem usually originates during note taking, it is essential to minimize the material recorded verbatim (Lester 2006). Students should take just a few notes in direct quotation from sources to help minimize the amount of quoted material in a research paper (Lester 2006). You probably don't realise but we paraphrase every day in our conversations. Abby: Oh my god, so yesterday I was just sitting at the cafeteria table and RAYMOND came over and sat next to me! He is SO HOT. Jessica: You mean, Raymond Rachel's boyfriend? Abby: Yep, exactly that Raymond! He was totally flirting with me though. Jessica: No way! He was flirting with you?! You gotta be kidding. Rachel sure wouldn’t be happy to hear that! Abby: Oh, he was definitely flirting. He asked me a ton of questions about class that day. He was all “I missed class so could you fill me in” but you KNOW that’s just an excuse! He was totally trying to get to know me. Let’s say you’re friends with Rachel. ​If you were relating what you heard, what would your conversation be like? Would you relate the conversation word for word? Would you say whether you believed Abbey to be a reliable source? This is relatively easy to paraphrase. You probably told Rachel what, in general, Abby said, but you also should have added your own interpretation (e.g. whether or not Abby’s account was reliable) and analysis of what action Rachel should take (e.g. whether or not she should ask Raymond about it, whether she should get mad at Raymond, etc.). Most of what you’d say to Rachel would be your own words and ideas. We tell someone about things we heard or did every day, while using our own words. 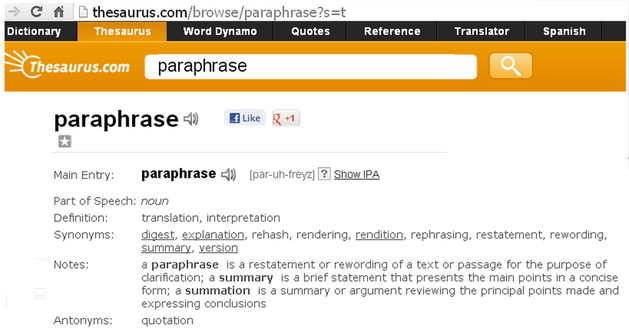 That’s exactly what you do in a paraphrase! The only difference is that you need to be more clear, in academic writing, about telling us exactly who said it and where (the reference). That’s like telling Rachel that you overheard some things Abby said in the cafeteria. Another difference is that the main purpose of academic writing is to develop and express new ideas of your own. You: "So Rachel, I overheard a conversation between two girls talking about how “hot” Raymond is. One of the girls, Abbey, seemed to think he was flirting with her. To be honest I think she was just exaggerating. She’s always convinced that everyone’s in love with her. She said that Raymond had asked her about something he'd missed in class because he’d been away. Somehow she interpreted this as flirting! I wouldn't be too worried if I were you." 2. Underline or highlight important words or concepts. The pyramids were built during a time when Egypt was one of the richest and most powerful civilizations in the world. They are some of the most magnificent man-made structures in history. Their massive scale reflects the unique role that the pharaoh, or king, played in ancient Egyptian society. The peak of pyramid building began in the Old Kingdom from the late third dynasty and continued until roughly the sixth (c. 2325 B.C.). More than 4,000 years later, the Egyptian pyramids still retain much of their majesty, providing a glimpse into the country’s rich and glorious past.